One disadvantage of my newfound love of reading on my Nook is that I’m unable to accurately reflect my reading progress on goodreads, which does so by page numbers of print editions. No such tracking exists as of now for ebook editions, so I’m going old school and talk about the short stories I read this past week here on the blog. The fiction I read this week came from one of the back issues of various ‘zines I purchased over the holiday, in this case, from Lady Churchill’s Rosebud Wristlet 19. “Tubs” by Ray Vukcevich. From Lady Churchill’s Rosebud Wristlet 19. Vukcevich is a favorite of mine. Any ‘zine with stories by him and Carol Emshwiller make it a must-have. If you want a clinic on worldbuilding a quirky world, this story is it. 5 out of 5. “Grebe’s Gift” by Daniel Rabuzzi. It might be a little unfair to read and rate any story having read anything by Vuk, a writer I admire for his usual brevity. Rabuzzi’s story is very rich and textured, if a touch slow for me. 4 out of 5. “Dropkick” by Dennis Nau. It took me awhile to warm up to this story. For a moment I thought it, too, was running a bit long for my taste. But the payoff was well worth it. I really loved the characters in this one. An enthusiastic 5 out of 5. “You Were Neither Hot Nor Cold, But Lukewarm, and So I Spit You Out” by Cara Spindler & David Erik Nelson. This one was a re-read from about three or so years ago when I’d read The Best of Lady Churchill’s Rosebud Wristlet. I’d almost forgotten what it was about until a certain secondary character was introduced. And then I remembered not feeling ready to be able to grok this story when I first read it. But I was now, and I loved it. 5 out of 5. “The Bride” by Kara Kellar Bell. This story seemed well-written but a bit predictable. Maybe because I’d read a story recently with a similar theme, but I’m not so sure about that. 3.5 out of 5. “Lady Perdita Espadrille Tells the Story” by Andrew Fort. I’ve never been a huge fan of the story-within-a-story, but I did enjoy both stories very much. I like to think it brought me close to world from which I was far, far removed in the ’80s. 4 out of 5. “The Slime: A Love Story” by Anna Tambour. My previous exposure to Tambour’s writing was her story in the Interfictions anthology, “The Shoe is SHOES’ Window.” And while I recognize a similar quirkiness in “The Slime,” I didn’t seem to enjoy it as much. 3 out of 5. “Such a Woman, Or, Sixties Rant” by Carol Emshwiller. But for the length, I thought this was more prose poem than fiction. And I really like prose poems. 4 out of 5. When I'm reading on a Kindle and someone asks me where I am in a book, I tell them the percentage. Then they ask me, "So what page mark is 30%?" 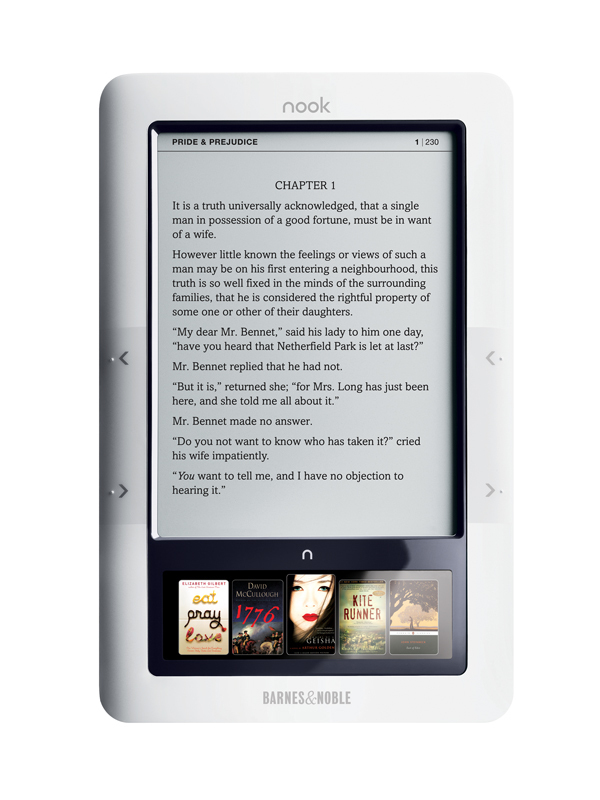 Respectfully, regarding page #'s – you're wrong (at least as far as I can tell on my Nook). Every page I read (or scroll through) shows it's actual page in the book, in the lower right-hand corner of the screen. It also, because of formatting issues, will pop up somewhere on the screen as I come to the bottom of a page with whatever the normal slugline would be (Kim Harrison, 307, Outlaw Demon Wails, just as an example).